We all learned intervention ideas in occupational therapy school. We heard all the research. 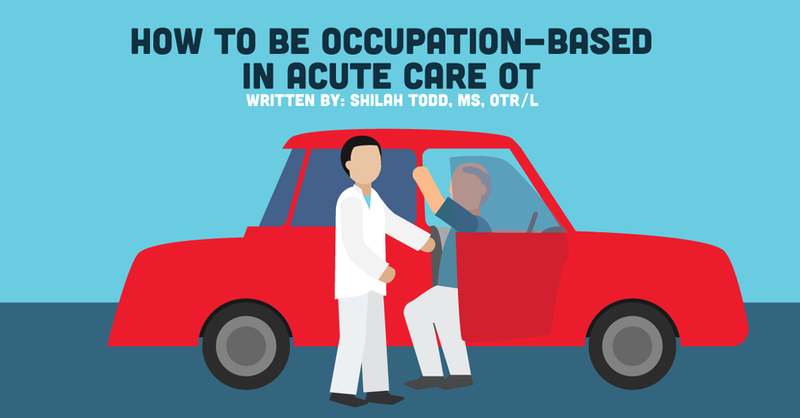 But once you get into practice, being occupation-based is a little harder to achieve with productivity standards, patient diagnoses, and acute care setting in hopes that you can carry these ideas over into your own different areas of practice! We hear that term so much throughout grad school that it becomes as common as anything else, but do we truly know what it means to be an occupation-based practitioner? Or to use occupations in our interventions? The American Occupational Therapy Association (AOTA) states that occupation-based practice is “client centered with occupation specifically integrated throughout the intervention process” (Ad Hoc Workgroup, 2005, p. 2). Throughout OT school we learned occupation-based, evidence-based, and client-centered were intertwined and were the key to better outcomes for patients. But it isn’t until fieldwork and even your first job that you get to logistically see how those things play out, and even what barriers there may be to practicing this way. There are multiple factors that prevent therapists from being able to be an occupation-based practitioner — whether it be the internal factors like a therapist’s values, habits, and personal biases or the external factors like reimbursement, productivity standards, acuity of patients, etc. (Ad Hoc Workgroup, 2005). However, these barriers can more often than not be remedied if they are brought to the attention of the therapist and team. One setting where it is especially challenging to always use occupation-based practice is in an acute care hospital. Personally, I have seen and experience this myself. Patients are often very sick, they are unable to tolerate very much, and you have lots of patients to see in a day, limiting how much time you can spend with each patient. Right now, we are going to talk specifically about total joint replacement patients. These patients are in and out of the hospital very quickly and because this is an elective surgery (meaning they chose to have the surgery), these patients have to discharge home, not rehab, MOST of the time. There are few exceptions to this, but in 9/10 cases the patient is going home, so our job as occupational and PRN assist within 1-3 days. Furthermore, beginning in January 2018, CMS made the decision that some TKA surgeries can be outpatient procedures. Therefore, patients will be discharging even more quickly now. So because we have this certification, and are a fairly large hospital, we have lots of joint replacement patients. We recently did a little revamp of our program and we have definitely seen the effects. We have a joint program coordinator (who happens to be a registered nurse) who does pre-op classes with patients, makes follow-up calls after discharge, basically acts as the liaison between surgeons, therapists, patients, and everyone else on the team, and so much more. The physical therapy assistant (PTA) is the team member in the gym who sees the patients for an AM and PM session. They do exercises in supine, seated, and standing. The PTA reports progress through written notes as well as communicating as needed to the coordinator, surgeons, and PT. Then there’s the occupational therapist. As the OT, my job is to complete an initial evaluation, of course, asking home and PLOF information, and then testing ROM, MMT, coordination, sensation. I then screen lower body dressing skills by usually asking them to take off a sock (knee replacement patients only, hip replacement patients have those precautions!). Then, depending on how much assistance a TKA patient needed, I would talk to them about adaptive equipment like a sock aid, reacher, and long handled sponge for lower body dressing and bathing. If they needed very little help or they live with someone, chances are they don’t need equipment, because that flexibility will come back very soon. However, if they need Mod/Max assist and they live alone, I’m going to recommend equipment for them, demonstrate how to use it, and then issue them their own. Now, for total hip replacement patients, everyone gets equipment! I demonstrate how to use a sock aid for donning socks, a reacher for doffing socks and donning/doffing pants, a shoe horn for donning/doffing shoes, and a long handled sponge for bathing the lower body. I told you we did some revamping of the program, and here is where that comes in. As occupational therapists we are the pros in functional transfers, right? So at the end of the AM and PM gym sessions, I now complete transfer training with each joint replacement patient. We use a pretend car to do car transfers (passenger side, of course! No driving for a few weeks post-op.) And we have a bathtub in which we practice tub transfers. I always ask the patient what kind of equipment they have at home, and then use that, whether it be a shower chair, tub transfer bench, or if they’re discharging with a 3 in 1 commode. During this transfer training, I educate patients on ways to make these transfers easier and safer (especially with THA precautions). So how has the revamp affected patients? Within the first few weeks, we started hearing patients say things like, “Well I was wondering how I was going to get in the shower!”, “Well I guess I’m ready to go home now,” “Oh, I feel so much better about that now!”, and “Well that wasn’t nearly as bad as I thought it was going to be!” When patients practice what they are going to do at home, they feel confident and ready to go home. Not only that, but within the first month we saw a dramatic decline in readmission rate for TKA and THA patients. In one month it went from 16.4% to 5.9% (BRMC Ortho). Do we know that it is because of OT presence in the joint gym? No. But it definitely didn’t hurt anything. I would be willing to bet we will continue to see a decrease in not only readmission rate but length of stay as well (length of stay numbers are only available quarterly, so I’ll keep you posted on how this goes ☺). With our joint replacement patients receiving interdisciplinary, client-centered, occupation-based care, it wouldn’t surprise me at all if these numbers keep trending down. The American Occupational Therapy Association adopted Vision 2025, which created guideposts to further communicate to the general public the goals of occupational therapy for now and in the future. One of those guideposts is Collaborative. I feel by being one of the collaborative members of the treatment team for TKA and THA patients, we as OTs can create effective outcomes for these patients. Furthermore, we are advocating for the importance of our profession. Another guidepost is Effective. By practicing with occupation-based, evidence-based, client-centered methods, we can create real cost-effective outcomes for our clients as well as the entities we work for. By educating and preparing patients for home, we are shortening hospital stay, and preventing falls and dislocations at home, which in turn creates much more cost-effective outcomes (AOTA, 2017). Although there are many barriers to occupation-based practice, it is possible. This is a model of how it is being done with one population in one hospital. We would love to hear about how you are being occupation-based in your setting! Ad Hoc Workgroup on Implementing Occupation based Practice. (2005). “The American Occupational Therapy Association Report to the Executive Board,” 1-10. American Occupational Therapy Association. (2017). Vision 2025. American Journal of Occupational Therapy, 71(3). 1. BRMC Ortho Service Line Scorecard. Performance Goals. 2018.